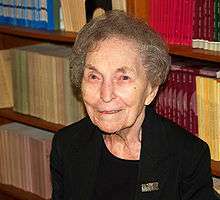 Anna Jacobson Schwartz (November 11, 1915 – June 21, 2012) was an American economist at the National Bureau of Economic Research in New York City, and according to Paul Krugman "one of the world's greatest monetary scholars". She was best known for her collaboration with Milton Friedman on A Monetary History of the United States, 1867–1960, published in 1963, which laid a large portion of the blame for the Great Depression at the door of the Federal Reserve System. She was president of the Western Economic Association International in 1988. Schwartz was born Anna Jacobson on November 11, 1915 in New York City to Pauline (née Shainmark) and Hillel Jacobson. She graduated from Barnard College at the age of 18 and gained her master's degree in economics from Columbia University in 1935, when she was 19. She started her career as a professional economist one year later. In 1936, she married Isaac Schwartz, a financial officer and fellow Columbia University graduate, with whom she raised four children. Her first published paper was in the Review of Economics and Statistics (1940), in which she, along with Arthur Gayer and Isaiah Finkelstein, wrote British Share Prices, 1811–1850. She earned her Ph.D. from Columbia in 1964. In 1941, she joined the staff of the National Bureau of Economic Research. She worked in the New York City office of that organization from then right up to the time of her death. When she joined the National Bureau, it was engaged in the study of business cycles. Though she held teaching positions for only a short part of her career, she developed younger scholars by her willingness to work with them and to share her approach, a scrupulous examination of the past, so as both to understand it better and to draw lessons for the present. In collaboration with Arthur Gayer and Walt Whitman Rostow, she produced the monumental Growth and Fluctuations in the British Economy, 1790–1850: An Historical, Statistical, and Theoretical Study of Britain's Economic Development. It appeared in two volumes in 1953, its publication having been delayed by the war for some ten years after it was completed. That book is still highly regarded among economic scholars of the period. It was reprinted in 1975. Arthur Gayer had died before the book's first appearance, but the other two authors wrote a new introduction that reviewed literature on the subject published since the original publication date. They admitted that there had developed what they called an "amicable divergence of view" on the interpretation of some the facts set out in the book. In particular, Anna Schwartz indicated that she had in the light of recent theoretical and empirical research revised her view of the importance of monetary policy and her interpretation of interest rate movements. Years before her first book was reprinted, another economist had joined what might be called the Schwartz team of co-authors. Prompted by Arthur F. Burns, then at Columbia University and the National Bureau, subsequently Chairman of the U.S. Federal Reserve System, she and Milton Friedman teamed up to examine the role of money in the business cycle. Their first publication was A Monetary History of the United States, 1867–1960, which hypothesized that changes in monetary policy have had large effects on the economy, and laid a large portion of the blame for the Great Depression at the door of the Federal Reserve System. The book was published in 1963, along with the equally famous article, "Money and Business Cycles", which as with her first paper was published in the Review of Economics and Statistics. They also wrote the books Monetary Statistics of the United States in 1970 and Monetary Trends in the United States and the United Kingdom: Their Relation to Income, Prices, and Interest Rates, 1867–1975 in 1982. She changed her opinion regarding financial regulation. Economists, bankers, and policy makers have been and are concerned with the stability of the financial system. Schwartz, in a series of studies in the 1970s and 1980s, emphasized that price level stability is essential for financial system stability. Drawing on evidence from over two centuries, she demonstrated that business failures do not have major consequences for the economy so long as their effects are prevented from spreading through the financial system. Individual institutions should be allowed to fail, not supported with taxpayers' money. There have been other areas of her work including the international transmission of inflation and of business cycles, the role of government in monetary policy, measuring the output of banks, and the behavior of interest rates, on deflation, on monetary standards. In an interview with Barrons in 2008, Schwartz said interventions such as injecting liquidity into markets and reacting to the credit crisis with ad hoc programs were not the answer. She has also done work outside of the United States. Some years ago the Department of Banking and Finance at City University, London, England, started a research project on the monetary history of the United Kingdom. For many years, she was an adviser to that project. She commented on papers, suggested lines of approach, came and spoke to students and at academic conferences where the work was discussed. In 2002–2003 she served as president of the International Atlantic Economic Society. She was elected a Fellow of the American Academy of Arts and Sciences in 2007. After 2007, she concentrated her efforts on researching U.S. official intervention in the foreign exchange market using Federal Reserve data from 1962. She was not afraid to speak out with respect to the financial crisis of the first decade of the 21st century, and criticize the government's response to it. She also addressed a critique of Milton Friedman by Paul Krugman. In addition, she wrote 9 books in her career, and published over 100 academic articles or comments. Anna Schwartz died on June 21, 2012, in her home in Manhattan, aged 96. Her husband Isaac predeceased her in 1999; they had been married for over sixty years. She was survived by four children: Jonathan, Joel, Naomi Pasachoff and Paula Berggren, as well as seven grandchildren, and six great grandchildren. ↑ Paul Krugman (March 29, 2007). "Who Was Milton Friedman?". The New York Review of Books. ↑ "Milton Friedman". Policonomics. 2012. ↑ "Past Presidents" (PDF). Western Economic Association International. Retrieved June 21, 2012. 1 2 Lipsey, Robert. "Anna Jacobson Schwartz". Jewish Women's Archive. Retrieved 28 August 2013. ↑ "List of Presidents of the IAES". Archived from the original on June 21, 2009. Retrieved 2010-01-31. . Accessed January 31, 2010. ↑ "Book of Members, 1780–2010: Chapter S" (PDF). American Academy of Arts and Sciences. Retrieved July 25, 2014. ↑ Brian M. Carney (October 18, 2008). "Anna Schwartz: Bernanke Is Fighting the Last War". The Wall Street Journal. Retrieved June 10, 2013. ↑ Anna Jacobson Schwartz (July 25, 2009). "Man Without a Plan". The New York Times. Retrieved June 10, 2013. Op-ed in opposition to January 2010 reappointment of Ben Bernanke as Federal Reserve Board chair. ↑ Edward Nelson; Anna J. Schwartz (October 2007). "The Impact of Milton Friedman on Modern Monetary Economics: Setting the Record Straight on Paul Krugman's "Who Was Milton Friedman?"". National Bureau of Economic Research. Retrieved June 10, 2013.